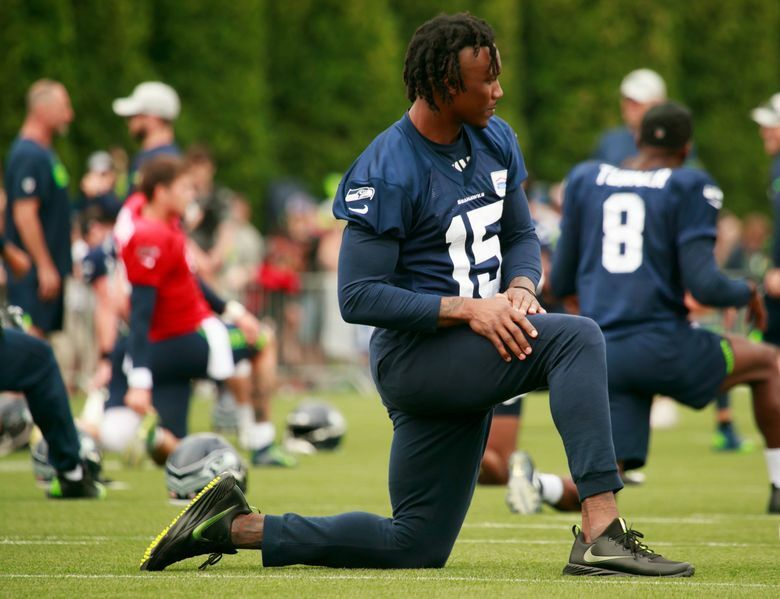 In his first dose of team drills on Thursday, first-year Seahawk wide receiver Brandon Marshall snagged a touchdown from Russell Wilson. But how confident is the 34-year-old that he can sustain that performance in his 13th NFL season? Brandon Marshall made a catch. And that, in itself, was a milestone. Not because he’s never done it before. Over 12 NFL seasons, the 6-foot-5, 232-pound receiver has stacked up 959 career receptions, to go along with 12,215 receiving yards and 82 touchdowns. There have been countless more practice catches from countless more quarterbacks, too. That, in a weird way, is what made Thursday’s catch special. For the first time since signing with the Seahawks in May, he looked like Brandon Marshall. Despite toe and ankle surgeries last fall. Despite being released by the New York Giants in April. Despite suddenly being a 34-year-old relic in an unforgivingly physical game. In his first dose of team drills in training camp, Marshall ran a fade route to the corner of the end zone on Thursday. Quarterback Russell Wilson blistered a liner to his back shoulder, and Marshall flipped his hips, leaped and snagged the ball while effectively blocking out 6-3 cornerback Tre Flowers. The crowd roared. The quarterback and receiver jumped and hip-bumped. “This is one of the toughest things I’ve ever been through as an athlete,” Marshall said of the recovery from his toe and ankle injuries. “One, you’ve got the ‘I’m aging’ part out there. You’ve got the self-doubt creeping in. Then the production slips. You get cut. There’s so much negative stuff happening. Wow, (now) you’re lying on a table, trying to be able to walk again. So, yeah, it’s very difficult. “The only thing that gets you over that hump is actually doing it and making those plays that you made in the past. So just being able to go out there and feel the grass the way I felt it before, with my feet under me, was special. Then catching the ball, that’s special. Being able to have the defender in front of you, that’s special. I almost had tears in my eyes today, being able to go in the huddle and break the huddle, just because of all the work that I put in. Granted, he’s no longer the physical mismatch that caught at least 101 passes in three consecutive seasons, from 2007 to 2009. He may not even be the guy that piled up 109 catches, 1,502 receiving yards and 14 touchdowns for the New York Jets as recently as 2015. But, in a wide receiver corps built around shorter, shiftier options like Doug Baldwin and Tyler Lockett, a healthy Marshall can still make a positive impact. But how healthy is Marshall, really? “I’m a little closer,” he said with a grin. “That’s part of camp. That’s part of the process. This is definitely a unique situation for me, coming off two surgeries and kind of rushing rehab, because I was cut. A couple teams started calling, and you have to prepare for a workout … when you’re not ready to work out. So it’s a unique situation for me this whole offseason, pretty much rehabbing for eight months. I didn’t have time to really train. And for the Seahawks, he’s playing ball at a relative bargain, the recipient of a one-year deal worth up to $2 million in incentives. With plenty left to prove, Marshall’s getting to work with Russell Wilson. One mistake at a time. One correction at a time. One catch at a time. “There’s some things that we’ve got to clean up and there’s some things that we’ve got to see. There’s some mistakes that we’ve got to make and correct,” Marshall said of his relationship with Wilson. “But the good thing about Russ is he loves ball and he loves talking ball. He loves watching film. So we spend a lot of time in the classroom talking about different looks – talking about third down, talking about red zone. It was a touchdown, a catch, a milestone — whatever you want to call it. Without context, it was nothing special. But for Marshall, it was a start. “We’re going to let my play do all the talking,” the 12-year veteran said. “I’m confident. Now I’m here. I’m that guy. I’m that aging football player, right? For so many years I sat back and watched guys say, ‘Yeah, I’ve got something left in the tank.’ It’s either you’ve got something left in the tank or you don’t. (No) quarter tank, whatever. If you don’t got a full tank then you can’t play this game.